In SOME* smartphones with AMOLED screen (such as Samsung Galaxy S4) black pixel = turned off pixel. I’ve always been irritated because of the fact that our batteries aren’t too great, but phone producers still produce their phones with hiper-resolution, which practically we cannot even see. I have invented something, that later I turned to real app. 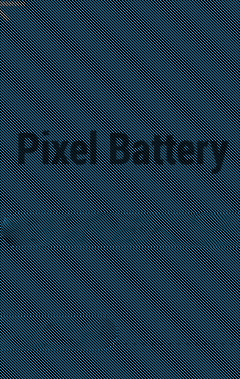 I called it Pixel Battery Saver, because it displays some kind of totally black mesh on the screen (you can change its density), so at least half of the pixels (or more) are turned off (so the screen consumes less energy! ), while you are still able to read anything on your screen. If you still don’t understand, just take a look at the screenshots. 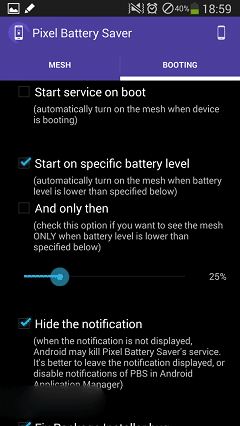 Download last version Pixel Battery Saver apk for android from revdl with direct link.